To be a speedster on a skateboard, the most important factor with regard to bearings is material. Manufactured from silicon nitride, ceramic balls are stronger and lighter than steel. They also last longer and are easier to clean. The balls are almost perfect orbs, reducing friction and allowing you to skateboard at higher speeds, according to Skateboard Bearings. The drawback is cost. The leader of the pack is Bones Swiss Ceramics, made by the trusted brand Bones Bearings and considered by the skateboard world to be of the highest quality and design. An eight-pack of the best from Bones runs $140, according to Bones Bearings. In October 2010, Mischo Erban, a downhill skateboarder from Canada, clocked almost 81 mph on a Colorado road to set a world record for skateboard speed. If you’re looking for the fastest skateboard bearings, Erban was using a GMR skateboard with Seismic 85-millimeter Speed Vent wheels and prototype Seismic bearings, according World Record Academy. According to Seismic Skate, their new Tekton technology keeps the balls in alignment, so they remain straight and roll faster. You can buy a set of eight ceramic wheels for $90 or a steel set for half the price. For the vast majority of skateboarders who can’t afford ceramic wheels, the original Bones Swiss bearings hang on to their favored status in the skateboard world. Launched in 1983 and made out of chromium steel, these bearings have earned a track record. These bestseller bearings come with a rubber shield to keep out debris and a nylon ball retainer. An eight-pack runs about $55. These bearings are also coated with Bones Speed Cream, a popular light-oil lubricant designed to reduce friction. 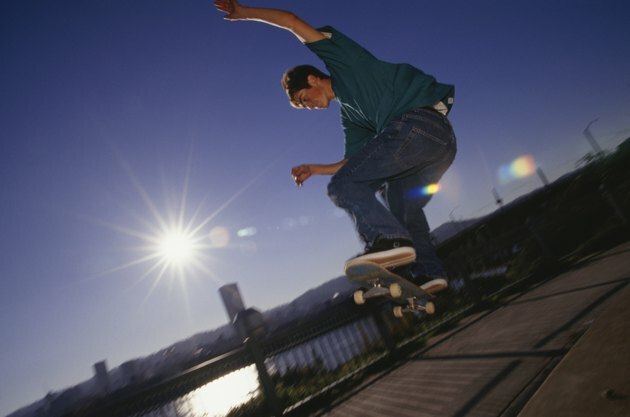 Skateboard bearings are rated by the Annular Bearing Engineering Council. For newcomers to the skateboard world, you may be impressed by a higher ABEC rating of 7 or 9. However, these ratings were designed for machinery, which demand higher precision in tolerance than skateboard bearings. In fact, an ABEC-7 rated ball may not last as long as an ABEC-3 bearing because its high tolerance makes it vulnerable to heavy use. All you need is an ABEC-3 or ABEC-5 bearing, which are easily serviced. What Are Good Bicycle Wheels for 350 Pound Riders?